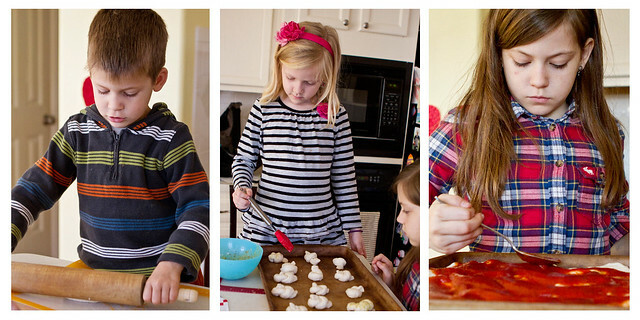 So last week we made two recipes from the Friend magazine that Ella was excited about it. The pizza was fine, but everyone liked the Crazy Pizza we made a little while ago better and the recipes were very similar. These little rolls were definitely a hit though and they were really fun for the kids to help make. 1. Cut each biscuit into thirds. Roll each piece into a 3-inch (7-cm) rope and tie into a knot. 2. 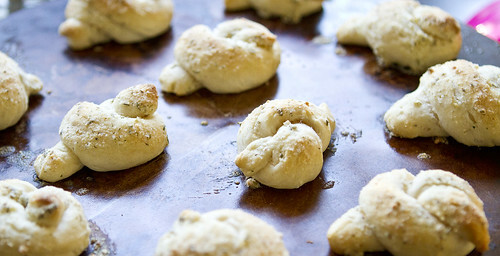 Place the knots 2 inches (5-cm) apart on a greased baking sheet. Bake at 400°F (204°C) for 8–10 minutes or until golden brown. 3. In a large bowl, combine the remaining ingredients. Brush or pour on the warm knots. Makes approximately 2 1/2 dozen knots. I decided to try a new recipe for our Valentine dinner and since I don't make shrimp very often (I love it but I don't love preparing it), knew this would be a treat. The recipe came from Clean Eating magazine but you would never know it :-). It was sooo flavorful and we all loved it! Just be sure everyone eats some, because you definitely will have some garlic breath afterwards! 1.Preheat broiler to high. Line a large baking sheet with foil. 2.Prepare sauce: In the bowl of a food processor, pulse cilantro, oregano, garlic and red pepper flakes until combined. While food processor is running, add oil and vinegar. Stir in salt and black pepper. Set aside. 3.Cook pasta according to package directions. Set aside. 4.Arrange shrimp on sheet; transfer to oven and broil for 3 to 5 minutes, turning once, until pink. 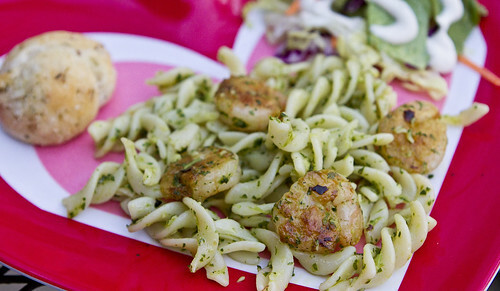 5.In a large saucepan on medium, add pasta and garlic-cilantro mixture and cook, stirring often, for 1 minute. Reduce heat to medium-low, add shrimp and stir to combine. In the January issue of Parents magazine they had a little spread of cake recipes and since Addie's birthday was coming up I let her pick one of them to be her birthday cake. She went with the chocolate peanut butter, which I was very happy about :-). 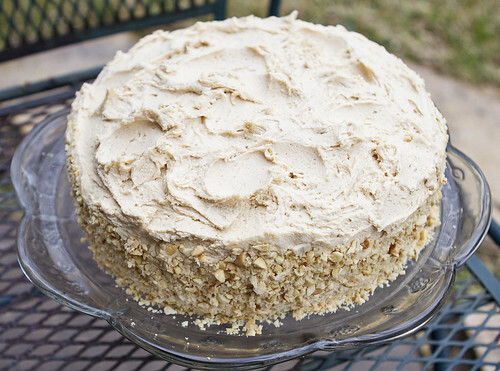 The beauty of this recipe is that you use a boxed cake mix so it is sooo easy! 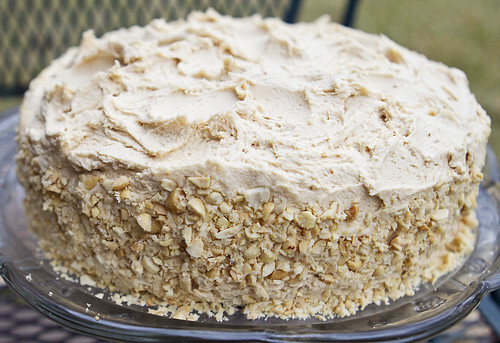 You make your own frosting, which is De-Licious, and then make it fancy with some chopped peanuts. It tasted amazing and wasn't hard to do! 1. Preheat oven to 350 degrees F. Grease and flour 2 8-inch round cake pans; set aside. Prepare cake mix according to package directions. Divide batter between prepared pans. Bake about 25 minutes or until tops spring back when lightly touched. Let cakes cool in pans on a wire rack for 10 minutes; remove from pans. Cool completely on wire racks. 2. Meanwhile, prepare frosting. In a large mixing bowl combine butter and peanut butter. Beat with an electric mixer on medium speed until smooth. Add milk and vanilla and beat on low just until combined. Slowly add powdered sugar, beating on low until sugar is just incorporated. Increase speed to medium-high and beat for 1 minute. 3. Use some of the frosting to fill and then crumb coat the cake. Chill the cake for 10 minutes to firm up the crumb coat. Generously frost the cake with the remaining frosting. 4. Make swirls in the frosting with the back of a spoon, using gentle pressure and lifting the spoon straight up at the end of each movement. 5. 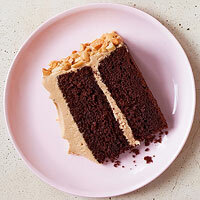 Cupping some of the peanuts in your hand, lightly press them around the sides of the cake. Once the sides are covered, use the peanuts that have fallen down onto the plate to press into any open spots.